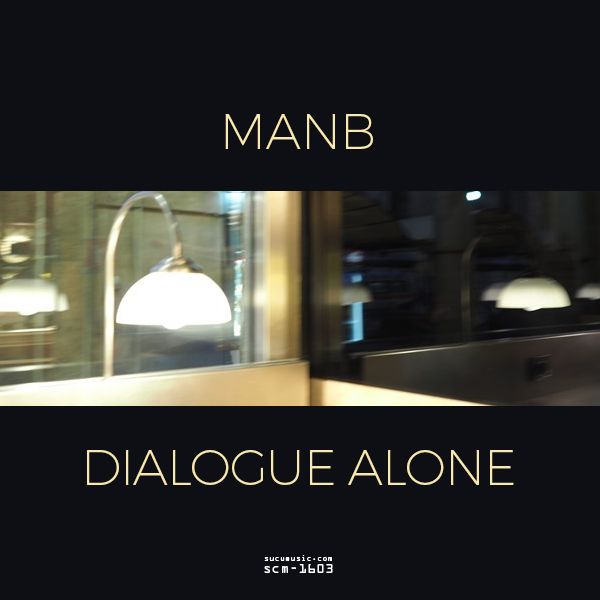 "Dialogue Alone" is the second Manb offering at Sucumusic. Overtake opens the tracklist. A sustained arpeggio enters on tiptoe announcing its sonic companions while a broken beat evolves its story as minutes passes by. The sensation is like traveling toward an untold destination, on a segmented roadway or railway in a November morning cold bright air. Vast spaces and landscapes caught in that intense twilight moment are so dear to the Artist. Actually in Substratum we could find ourselves slowly casting our stare over roofs bathed in the thick air of a late April sunset, while a continuous synth-pad and a pulsing kick tone turn away our day worries. A Tangerine Dreamish arpeggio makes us notice some kind of antennas' grid, framing the vision. A hypnotic bassline together with minimal rhythm mutations is what characterise Abutment. A kind of retro-future dance tune where urban shapes quickly appear from multiple vanishing points, coming up against your eyes to accelerate your perceptions and reactions. Countenance. An unidentified metal plate hit by enormous flying insects in the dark opens the scene to this post trip-hop track. And while your heartbeat is asymmetrically shifted by a broken beat kick, the anguish increases when obsessive basslines and pads powerfully find their way to your brain cells. The track fades with a buzzing note as those insects move away, leaving you alone, with your broken heartbeat and all your unanswered questions. In Hum you slowly open your eyes, not sure of what thoughts you were following. A reversed crowd noise strangely makes you feel at home. Celesta chords, reversed vibraphone notes and a peaceful synth-bass sequence slowly chase each other like soothing ingredients in a stirring cocktail, bouncing in a chemical carousel. At the end, when the mix is done, watchful eyes upon an empty glass and your heartbeat restored are all that remain, echoing in the near valley below.